Kendo is a Japanese martial art. If you can read the kanji, it is easy to understand what kind of martial art kendo is. The first character, 剣, means “sword”, and the second character, 道, means “way of”. So, kendo is “the way of the sword”. Interestingly, the second kanji (道) crops up in a lot of traditional Japanese activities, such as chado (茶道 / Japanese tea ceremony) and shodo (書道 / Japanese calligraphy). 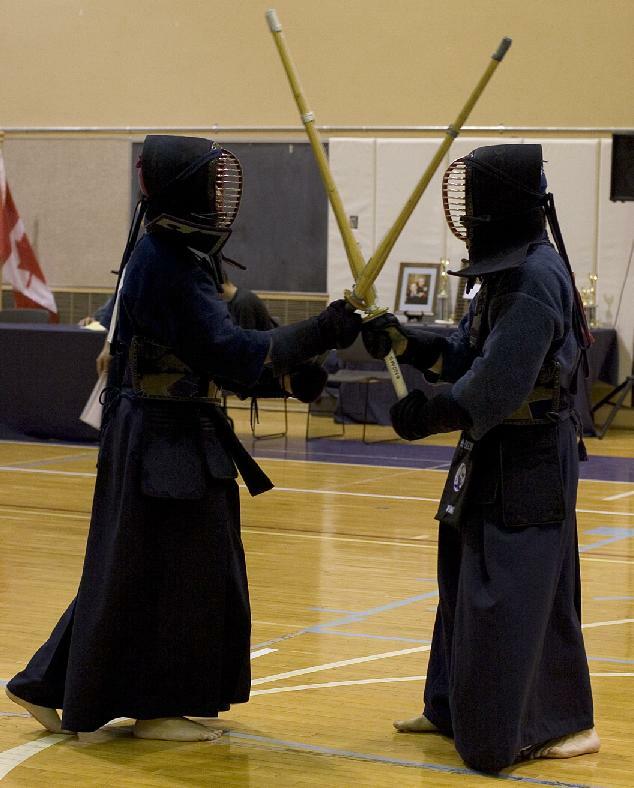 The word “kendo” is a relatively recent term, and implies spiritual discipline as well as fencing technique. Prior to the Showa period (1926-1989) kendo was usually called “kenjutsu” or “gekken”. The Dai Nippon Butoku Kai changed the name to “kendo” in 1920. Although kendo is “the way of the sword”, a traditional metal sword is not used. The weapon in kendo is called a shinai (竹刀) and it is a kind of bamboo sword which looks like a wooden pole. I can’t claim to be any kind of martial arts expert, but I have an appreciation for the skill and commitment involved in learning a martial art. 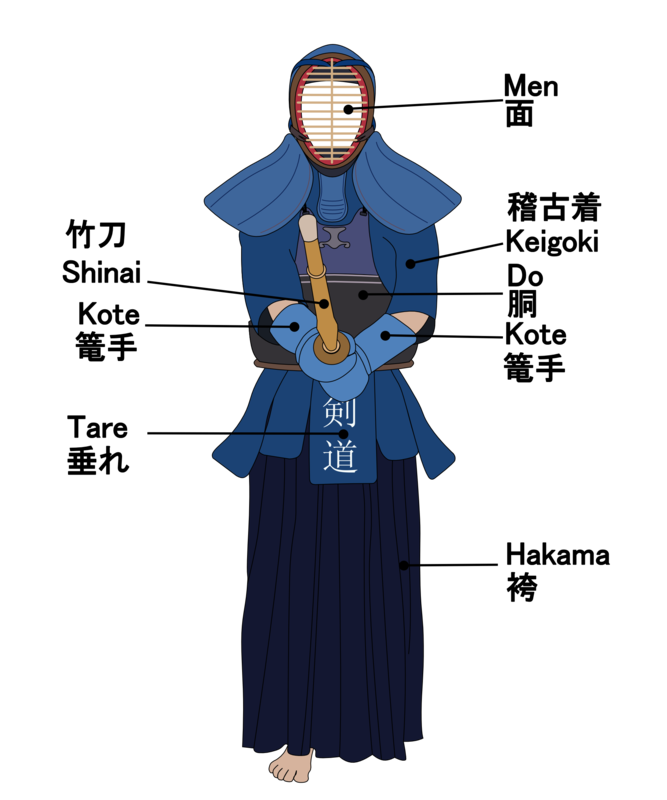 I don’t think I would be strong enough to become good at kendo, but it’s something I would be interested in having a go at. Of course, a lot of equipment is needed for kendo (although no shoes are required, as it is practiced bare foot). I found this excellent graphic on Wikipedia which labels everything in Japanese. I once knew an Australian guy in Japan who practiced kendo, and he told me that he never washed his kendo clothes. Apparently they really stunk from all the sweat. He implied that no one washed their kit because of some rule, but I don’t know if that was really the case. Someone who practices kendo is called a kendoka (剣道家). There are hundreds of thousands of kendoka throughout Japan, and of course kendo is practiced internationally, too. It is estimated that there are around 6 million practitioners of kendo world-wide. You can find out more about kendo in the UK at the British Kendo Association. You can almost feel the samurai spirit, can’t you? Kendo actually developed from early swordmanship techniques during the first Samurai government in the Kamakura period (1185-1333), although back then it was known as kenjutsu, as I said above. Have you ever practiced any martial arts? How about kendo? Do leave a comment below if you have. If you’re interested in learning more about kendo, there’s a fantastic beginners’ guide available to download here. I have always had an interest in Kendo and it was very popular at my JHS in Japan. I believe Kendo was developed by the samurai as a way of training during non war periods without killing each other with real swords. There are still some famous samurai families practicing and teaching kendo in Japan and it is amazing to watch some of these traditional families demonstrate their skill and art. Wow – I expect you know a lot more than me about kendo then. Thanks for leaving a comment! Very interesting! Thanks for sharing! As a keen ‘Japanist’ I always find its an absolute pleasure reading your posts. One of my female students is a kendo geek. She’s very successful at it, too! I like it, but not enough to actually practice it. Do you play taiko? I would LOVE to, if only I had the time… (er, and the rhythm). I live in the boonies and the next taiko lesson is 2h away by car (but I don’t have a car).